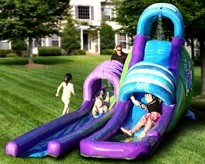 Enjoy double the summertime fun with this dual water slide. Your kids will spend hours slipping and sliding on the 22' long run-n-slide and the tall single slide. The arches provide stability and safety while children climb and slide. Product Features: Supports up to 300 lb. * Durable 420D nylon fabric and PVC vinyl Ages: 4 years and up Includes water slide, carrying case, blower, stakes, water hose with sprayers and patch kit Dimensions: 22'l x 8'w x 8.8'h (Model FSWS-MS01) *Recommended for only 1 – 3 children on the slide at a time.